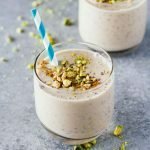 Creamy and sweet Banana Cashew Butter Chia Seed Smoothie! This super healthy smoothie is perfect for starting the day off in a healthy and energizing way! Lately, I’ve been super obsessed with smoothies. Specifically, adding chia seeds to smoothies, as you can see via the Strawberry Banana Chia Seed Smoothie I made JUST last week! OBSESSED. It’s really a crazy thing because I’ve never been much of a smoothie person. It’s not that I don’t love how they taste, it’s just that I hate having to wash the blender after I make them. The thought of doing that everyday….bleh. I’d rather not. Prep this Banana Cashew Butter Chia Seed Smoothie in Advance! BUT THEN….I discovered the power of freezing things! It’s funny how forgetful one can be to what seems like the most obvious thing. Why did it ONLY JUST NOW occur to me to make smoothies in bulk, freeze them, and then just thaw them out the night before I need them? Needless to say, I’ll be heading to the kitchen after I write out this post to bulk-make more of this Banana Cashew Butter Chia Seed Smoothie, this Dragon Fruit & Goji Berry Smoothie, and this Turmeric Pineapple & Kiwi Kale Smoothie for breakfast and snacks that’ll last all week long. #MealPrep, y’all! The texture and taste of this delicious Banana Cashew Butter Chia Seed Smoothie is AMAZING! I’m not sure why, but adding chia seeds to smoothies seriously takes them to another level. Like, REALLY. You have to try this! Maybe you already have and I’m just super-duper late to the smoothie game, but it has basically been life changing for me. I started adding chia seeds to my smoothies because I had this massive bag of the BEST chia seeds ever (they’re organic! I love this brand!) that I needed to start using more of before they expire. I’m sooooooo glad that I did! I’ve been missing out this entire time. Chia seed anything is delicious, but chia seed smoothies are EPIC! Cashew butter is sold at most stores (or on Amazon), but I think almond butter would be amazing as well. I personally like using lightly salted cashew butter for a hint of sweet/salty, but feel free to use whatever you prefer! Oh, I love the sound of this smoothie, cashew butter is my fave!